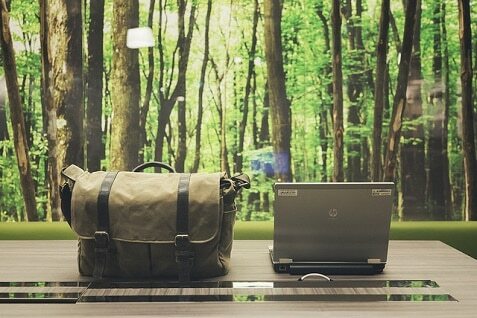 Being a Green Workplace is important to the modern business. It’s not just about recycling paper; it’s also about promoting business practices that make a real difference to the environment in the long term. Turning your business into a shining example of eco-friendliness is not an overnight exercise – but neither is it impossible. In fact, some relatively simple steps are needed to ‘Go Green’ at work – and to promote it. Of course, no one has perfected the eco-friendly business model yet, but the idea of adopting sustainable, resource-efficient procedures that are as good for business as they are for the world around us, is no fantasy. By making a series of straightforward changes in how your workplace operates, it can be done. Promoting such things is what the Greenroom is all about. So we’ve put together a list of 6 easy ways in which your business Go Green, and can enhance its reputation for greener, cleaner and more efficient practices. If you question how much difference it makes for businesses to Go Green, then it’s worth looking at the statistics. Research consistently shows that the public is interested in the environment and in countering climate change, and any business that promotes a greener working environment and eco-friendly work practices is more highly thought of. A 2009 Auspoll survey Tracking Climate Change Attitudes, which was commissioned by the Climate Institute, revealed that 15% of Australian consumers were ‘Extremely Concerned’ with climate change, 28% were ‘very Concerned’ and 36% were ‘Concerned’. Just 5% were ‘Not At All Concerned’. In 2010 another Climate Institute-commissioned survey, Climate Of The Nation, revealed that 29% of Australians ‘Strongly Agree’ and 57% ‘Agree’ that businesses should be more active in helping to make the change to a cleaner, smarter economy. It also showed that 84% either ‘Strongly Agreed’ or ‘Agreed’ that it was unacceptable that some businesses focus too narrowly on profits while ignoring the risks of their pollution, and that 35% ‘Strongly Agreed’ that polluting businesses be made to take responsibility and be charged for their pollution. It’s tempting to think that small operations can hardly be expected to do very much. But for small and medium sized businesses, ignoring the preferences of their customers is dicing with commercial disaster. And besides, because every little step helps, even small things by small businesses make definite contributions to any overall improvements. So, what can be done to Go Green at work? Does it mean introducing life-changing regulations? Does it mean imposing strict practices that make work more difficult? Not at all. The steps are easy, and while effort is required, the results make the working environment better and the working experience more positive for the staff. Here are just 6 of them. Are separate recycling bins provided in work – plastic, paper, glass etc? If so, why not? What about packing a prepared lunch for work instead of buying a packaged lunch and increasing waste? It has been lobbied for long, and in many ways this principle has been adopted. But switching to energy-saving appliances means more than simply switching your computer off at the end of the day, and using energy-efficient compact fluorescent light bulbs (although both definitely help). The actual appliances that you use in your workplace often consume more energy than they need to, making them extremely inefficient and a major contributor to the carbon footprint. The best way to address this problem is to upgrade your office and workplace equipment. Older models are much less energy efficient that newer models. In fact, the difference in consumption can range between 50% and 90%. So, switch from laser printers to ink-jet printers, and replace the energy-feasting old office PCs with modern laptops, which have been designed for users on the go.In the restroom, check out hand-dryers which typically use a lot of energy, and consider whether switching to paper towels might be a greener choice. And while you’re there, how efficiently is water consumed there too? Consider installing automatic-stopping taps to reduce water wastage, and look into the possibility of modern dual-flush toilet units which use about 25% of the water per flush the older single flush toilets do (12 litres). Urinals can save as much as 30% per flush. Such steps really do work. A survey by Energy Australia asked 2,000 retail and manufacturing professionals how their businesses saved on energy costs. Some 31% said that fitting energy-efficient appliances had worked in saving money, while 22% said installing automated energy control systems and automatic lighting had also made a genuine difference. When looking for appliances for a workplace, check out Australia’s own Energy Rating Label for information on the best options. It would also be worthwhile reading the advice Energy Australia is offering. Another common source of energy consumption is heating and cooling systems. By installing energy-efficient heating, ventilation and air-conditioning systems or by simply regulating their use, you can slash the figures dramatically. Collectively referred to as HVACs, they account for around 40% of a business’s energy consumptions, but using them correctly can mean energy consumption savings of as much as 50%.For more details, read what the Energy Efficiency Exchange (EEX), the Australian government’s own energy saving awareness drive, has to say.But there are also several small things can be done in the office to help the cause. It’s not the most commonly referred to option, but encouraging your staff to get to work with more eco-friendly modes of transport is actually an excellent way to lower your business’s carbon footprint. This is because your footprint is calculated by the effect every aspect of your operation has on the environment, and the requirement for staff to travel to work is one of them. Encouraging green commuting can have a greater impact socially and nationally too. According to the National Geographic’s 2014 Greendex survey, Australians still rank pretty poorly when it comes to using public transport, sharing vehicles and otherwise choosing a greener way of getting to work. In Australia-specific survey results, Australians are among the least frequent users of local public transport, and the least likely to frequently walk or bicycle to work. In fact, only 9% of Australians use a bicycle for commuting at least once per week. The National Heart Foundation of Australia published a survey on Financial Incentives To Ride To Work revealing that 80% of workers aged between 25 and 54 supported the idea of financial incentives to cycle to work rather than drive. That may mean direct or indirect subsidies paid to workers, or a tax deduction provided for bicycles purchased by workers. TravelSmart Workplace is a national program that has been embraced in WA particularly, it offers a host of advice to businesses to get onboard. Ride2Work is a national program which provide workplace coordinators for help in organizing programs. There are several ways to encourage your staff to get involved in a green, not least the health benefits to them. Financial are there too, but check with your local authority to see what financial incentives can be passed on via the workplace. Staff Involvement – employers can appoint a team to develop the in-house recycling and green practices program. After all, who knows better how things can be changed in a practical way? Working together, more effective recycling and energy reduction drives can be initiated and general best practices and principles can be adopted. Just make sure the necessary resources are available. Also, make it fun! Encourage staff to come up with activities and events that promote the greener practices. Educate on Benefits – when people know why a change is good, they are much more likely to agree to it. Put up posters to promote the benefits of going and staying green. You might also produce a monthly or quarterly Go Green newsletter where information can be shared, not least the results of your own energy-saving and recycling efforts. If they are unwilling to change, you might want to consider other options, but most already offer environmentally-friendly cleaning services.Good Environmental Choice Australia (GECA) casts an eye over the status of a wide variety of products, including cleaning products. Look for their GECA Green Star rated product. Also, check out what the Australian environmental research and education body, Fresh Green Clean, is saying for more on eco-labeling and what you should be looking out for. Alsco’s own Fresh & Clean range offers cleaner restroom hygiene options, while for workshops and garages, Alsco’s EcoSafe Washer provides effective eco-friendly machine parts washing. The idea that adopting a programme to Go Green at work is a headache and financial drain is hardly accurate. The fact is that modern business is geared for the switch to eco-friendliness. And besides, there is plenty of help out there for those who want to make the switch or maximize their green status.